Most people don’t think of Boston as a sushi destination, but they should because, well, the ocean. Tons of great local seafood equals tons of great local sushi, and our fresh-fish chefs use this massive palette to please your palate. From simple nigiri, to elaborate maki, here are the 10 best spots to get your sushi fix in the Hub. 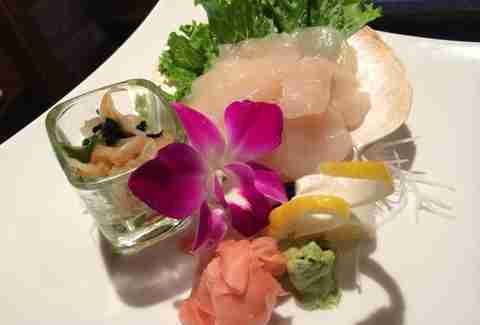 The constantly rotating menu and elegant presentations keep Café Sushi devotees coming back early and often. For the adventurous, savor something exotic with anything in season (nigiri or sashimi) such as Aji (Japanese horse mackerel) or Kamasau (Japanese barracuda). The ceviche maki is a Latin/Japanese mashup with tako, shrimp, salmon, grape tomato, and avocado dazzled with lime juice. 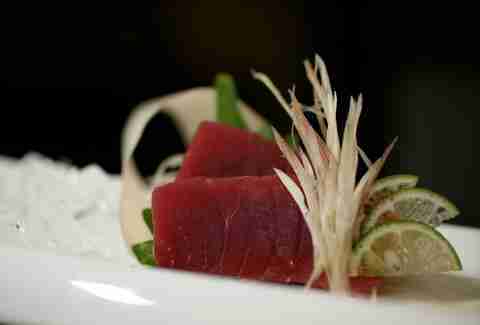 But since it's all about what’s new, the omakase tasting spree ensures you experience Chef Seizi Imura’s daily magic. Avana ditches the frills for a straight-up sushi experience. Grab a spot at one of the sturdier tables and dive into Spicy Caterpillar maki, a unique combo of eel, avocado, spicy mayo, and eel sauce. Or try the hometown celebration Spicy Red Sox maki with crabstick, spicy tuna, and “crunch.” Your best bet is to bring pals and get the gargantuan 58-piece sushi & maki platter loaded with specialty rolls (Salmon Cheese Avo maki) and exotic selections (Surf Clam). Deep in the heart of the "Innovation District" is Empire, a formidable sushi destination chock full of traditional and contemporary Asian delicacies. In addition to classic maki and nigiri, Empire crafts deft signature items such as the Hamachi tartare roll with avocado and gobo, the Red Dragon roll with blue fin tuna, and torched yellowtail made crunchy by tempura bits and "rice crispies." Perfect pairing: the Rye Tai, a sipper created by industry legend Brother Cleve and fueled by Bulleit bourbon. For many moons, the Brookline fave "house of exquisite excellence" has been the go-to spot for all things sushi. Still is. Reserve an official tatami room and rejoice in the sashimi taco trio, a flavor party of tuna, salmon, and lump crab meat in crispy gyoza skin shells. 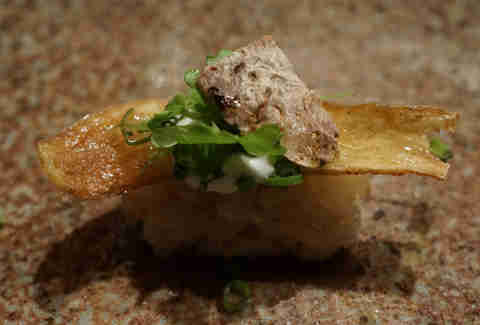 FuGaKyu also gets funky with seasonal sushi treats like tuna belly and foie gras with spicy daikon radish. Deciding is hard, so you might opt for a set dinner (mini kaiseki or the full six-course blowout) for the chef’s limited-edition creations. 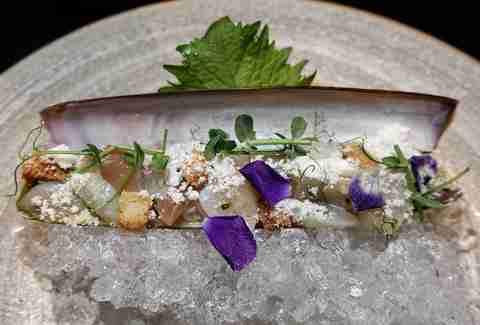 Haru, Japanese for "spring," keeps bright seasonal flavors front and center on its ever-evolving menu. The extensive selection includes special rolls like Spicy Titanic, a revelation with salmon and caviar wrapped around spicy tuna. 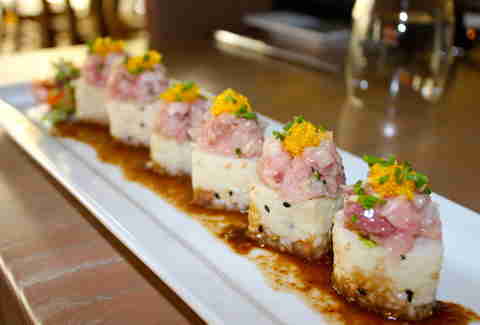 The Boston unCommon features crunchy spicy salmon combined with mango, black tobiko, and gold leaf (#fancy). However, the major fan favorite here is the Strawberry Fin: a sweet/spicy balancing act with yellowtail, scallops, jalapenos, wasabi tobiko, and strawberries. Itadaki, Boston’s only Izakaya restaurant, takes the Japanese gastropub theme to a new level with sharable plates, inventive rolls, and beautifully presented traditional platters. 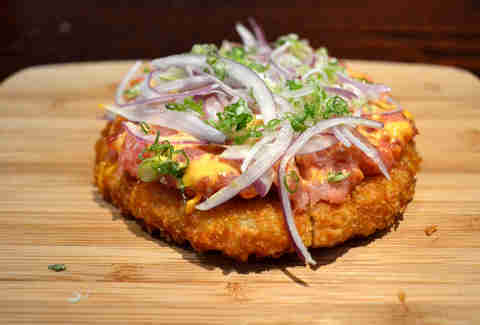 Start with a sushi pizza, a fried rice cake with seven different sashimi toppers (e.g. Itadaki spicy tuna, salmon tartare). 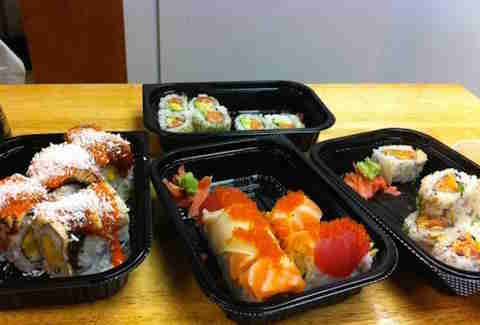 Then ease into some rolls like Una-Avo (eel, avocado, eel sauce), spicy salmon, and tempura shrimp. For maximum effect, order the sushi dinner... the chef’s daily nigiri selection carefully composed just for you. Another long-time local sushi stronghold, Chef Ting Yen’s Oishii balances old school, father-to-son training, with new school flavors. 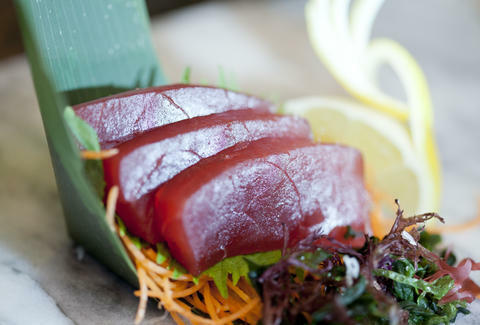 The broad a la carte slate boasts 12 tunas and 10 shellfish (for starters), and its sea urchin is pure art. For specialty rolls, The Maki incorporates asparagus, bonito flakes, and toro that get torched for some smoky mojo. A trip to Oishii is incomplete without The Coconut Sphere dessert, a literal sphere of coconut ice cream topped with coffee mousse, yuzu sherbet, and chocolate. 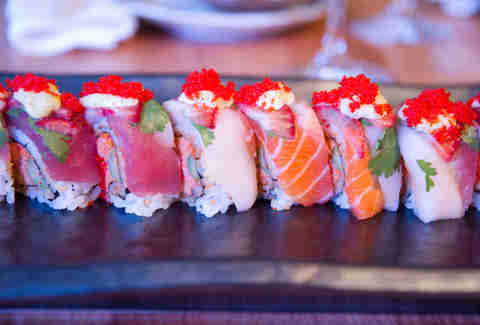 All of Boston's sushi lovers agree that Chef Tim Cushman’s O Ya is THE place for extravagant nigiri and sashimi. Just be sure to bring your wallet. This upscale splurge-fest aims for perfection in the house mmoked Wagyu nigiri hit with some yuzu soy, and the cheeky Legs & Eggs, a must-have bite with tiny Maine lobster legs, and Russian Ossetra caviar. In the sashimi realm, Scottish salmon melts in your mouth while the Kumamoto oysters with watermelon pearls satisfy your sweet tooth. Tucked inside Clio’s lounge is Boston’s other over-the-top sushi mecca courtesy of superstar Chef Ken Oringer. Sourcing locally and from Tokyo’s Tskuiji Market, the nightly changing menu includes wonders such as Smoked Uni Spoon crowned by quail egg yolk, and Shima Aji (Japanese Striped Jack) flavored with black sesame, goji, and citrus. 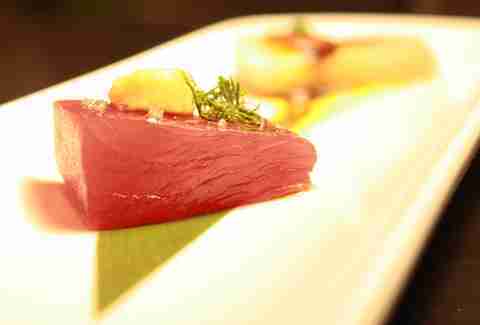 If you’re lucky, they’ll have the Hon Hamachi Toro, Japanese yellowtail belly rendered smoky by pork belly croutons. Aside from having the coolest restaurant name ever, this Asian fusion hotspot mixes a jazzy soundtrack with jazzier sushi. Your extended dinner jam should concentrate on signature offerings like the decadent uni with quail egg and the Volcano roll with spicy scallops, kanikama, and scallion. 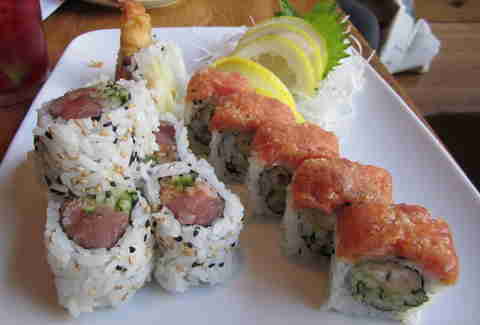 Gaga’s Monster roll has an all-star roster of ingredients such as tiger shrimp, tempura crunch, octopus, and raw tuna. To really stuff yourself, the Sleeping Beauty roll is a showstopper with escolar, crushed pineapple, and tempura flakes drizzled with pineapple lime mayo.